Christine “Chris” Eleanor McLean (nee Hansell), aged 76, went to be with her Lord, Friday, January 25, 2019. Chris was born November 17, 1942, at St. Boniface Hospital in Winnipeg, MB, but called Saskatoon home up until her passing. Chris was a lover of music and an avid musician. During the 70’s and 80’s, a member of the singing group “The Group”, and then “Happy Music”, Chris loved to share her joy of music singing and playing the many instruments in her repertoire, which included the banjo, auto harp, guitar and organ. Her love of music transcended throughout her life to include her love of her faith and God. For 20 + years she was a congregation member of Saint Peter the Apostle Parish, where she was musical director of the 11:30 a.m. Sunday Mass, which she was also a member along with her 2 eldest sons. 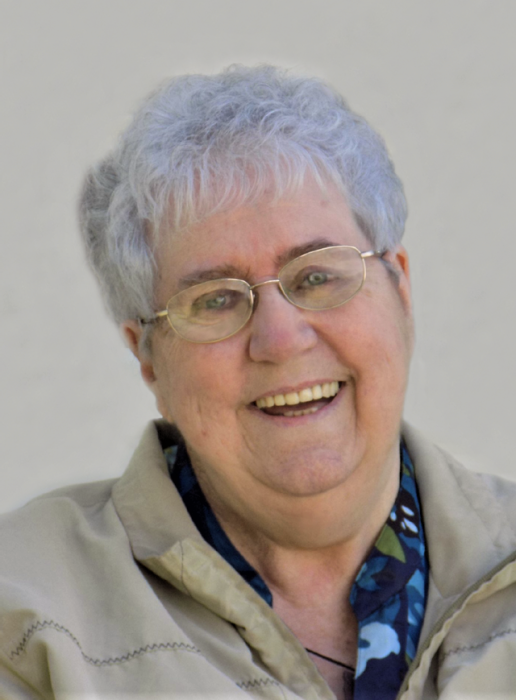 A member of the Catholic Women’s League for over 40 years, Chris took great pride as a representative of the Catholic Church; a congregation member of Saint Peter the Apostle, Vanscoy Catholic Church, St. Anne’s Parish, Holy Family Parish and the Cathedral of the Holy Family, until her passing. Chris also participated as a Lay Minister, working with Bishop Mahoney, until his passing. Chris’ faith never wavered, even throughout the worst of her illness, where she knew God would take care of her. Along with music, Chris’ other passion was her animals, especially her dogs. Chris and Wells owned and operated Canere Kennels where they boarded dogs and where they raised and bred champion German Sheppard’s. Travelling the dog show routes throughout Saskatchewan and Alberta right up until they sold the farm in 2008. Chris’ career spanned over 40 years, working as a secretary at Royal University Hospital in the neurosurgery department and then orthopaedics, but her main job and what she was most proud of, was her family. Following retirement and selling of their farm, Chris and Wells spent their time during the summers jumping into their motor home and travelling to rodeos, chuck wagon races or extended vacations to the east coast. Beloved wife of Wells of 58 years, dearly loved mother of Ron (Cathy), Wells Jr, Desmond (Tammy) and loving grandmother to Becky (Aden), Brittney (Chris), Steven, William, Kyla, Raelyn and Dallas. She is also survived by her sisters Margaret Ann (Ed) Moroz, Cathy Hansell, sisters-in-law Margaret Wasylciw, Paulette McLean and brother-in-law Glen McLean and many nieces and nephews. Chris is predeceased by her parents John and Christine (nee O’Sullivan) Hansell, and brothers-in-law Melvin, Don and Gord. A special thank-you to the doctors, nurses and care aides who cared for Chris at Royal University Hospital these past few months. Relatives and friends are invited to share in a Mass of Christian Burial at 1:00 p.m. on Thursday, February 7, 2019 at the Cathedral of the Holy Family (123 Nelson Rd.) in Saskatoon. Interment to take place at a later date. In lieu of flowers, donations can be made to the charity of your choice.